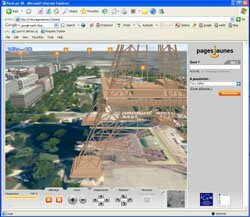 The French Yellow Pages has just launched their own beta application featuring 3D streaming of Paris and its impressive. Running in Shockwave 3D it features basic textures on buildings – normally a single texture cloned along each facade – and simple roof structures. The roofs are mapped from a air photo and this adds considerably to the sense of place in the model. Another interesting addition is the use of ‘billboards’ for trees along the streets. The question is that although we are all about visualising the city, does it aid navigation in terms of a Yellow Pages? We would argue that applications such as Google Maps are better suited to finding services in cities, possibly a view that goes against the point of the blog but having used the Paris model we don’t think we would have the patience to search and navigate in 3D. This is mainly due to the slightly slow loading times and framerates. So the question is – is it eye candy or does 3D actually add to the Yellow Pages?